First: What is a termite!? The Basics. Termites are small insects that are known for eating dead plant material like the wood in your house. While there are thousands of species worldwide, there are less than 50 different types native to North America. These typically fall into three groups defined by their ecological niche – dampwood, drywood, and subterranean. What are you likely to find in Humboldt? The Pacific Dampwood Termite, zootermopsis angusticollis (for anyone who's asking), is one of the more common Termite species in Northern California and throughout the Pacific Northwest. They establish colonies slowly but a sizable infestation can occur within two to three years. You will also find Subterranean Termites that are a fan of our calm Northern California climate. Mature colonies of Subterranean Termites, like the Reticulitermes, are known to be some of the most destructive termites and are often found in mature colonies that can contain hundreds of thousands of termites. They are physically smaller than the dampwood, typically dark brown, and can be found within fallen trees, stumps, and structural lumber. However, you will find color is typically within their swarmers, otherwise the Subterranean Termites are typically a whitish color. When Should I Be on the Lookout? Dampwood termites will typically infest homes from August to early October when the weather starts to cool. However, you will likely find subterranean termites during the warming seasons of Spring and Summer. The other reality of termites in coastal regions like Humboldt & Del Norte is that we are typically blessed with a much cooler stable climate than the rest of California. This can mean that termites in particular are more prone to hang around as our seasons are less dramatic with more stable temperature. Just keep in mind that because it's summer it doesn't mean you won't find termites. Swarmers. These are the reproductive members of a termite colony. When looking for new places to found a colony, large groups can be seen flying and searching for a suitable place to lay eggs. Discarded Wings. After termites mate, they lose their wings. The presence of discarded wings means that termites have found somewhere nearby to lay their eggs. Structural Damage. Termites feast on wood but wood is not the only material threatened by these insects. Termites are known for eating their way through various plasters as well a furniture and cabinets. Is it possible to treat termites myself? We always recommend you try some Do It Yourself (DIY) treatments if possible. However, we want to stress that DIY treatments for pests are best used as preventative care. If you have an infestation of termites in your home, call a professional as soon as possible. Without expert care you could be putting your self at higher risk and possibly investing in potentially dangerous chemicals or self repairs that will ultimately cause more damage. Effective Pest Control requires consistent monitoring. Just because there are no more signs of damage doesn't mean the termites are gone. You must be persistent in treatment and prevention. Preventative Measures. The best way to treat termites is to avoid them in the first place. Ensuring that damp places, like the crawlspace under your house, have adequate ventilation will prevent moisture from building up. This discourages dampwood termites from nesting. Replace Damaged Wood. While it’s not always possible, replacing damaged wood with pressure treated wood is one way to rid yourself of termites and prevent future infestations. However, we want to stress that simply removing the wood may not properly rid termites from your home or business. Always call a pest inspector to make sure you can get to the root cause. It's also important to note that DIY solutions that require replacing and repairing home damage is only recommended for professionals. We're providing a lot of warnings here because we've seen this done horribly wrong too many times. Save yourself time and stress and call a professional first. *Termiticides. These are used as a preventative measure. Spraying the perimeter of your house with a termiticide (termite insecticide) deters termites from finding the damp wood around your home that is so inviting. *Termite Baits. Termite baits are usually pieces of paper or cardboard that contain a substance toxic to termites. These are slow acting agents to ensure the greatest dissemination of the toxin among the infestation. *Warning: If you have small children or pets, chemicals and pesticides off the shelf can be dangerous to use without extreme caution. It's important to note that professional products (like what we carry) are designed to be safe for your family and furry friends. Please use extreme caution. Remember: The best treatment for termites is to prevent getting termites in the first place! Humboldt Termite & Pest Control? As soon as you suspect you may have termites, give a professional a call. These insects can prove incredibly difficult to treat after they've starting eating away at your home or business. Without proper training you could remove some but not all of the termites, leaving your home vulnerable to termite damage. Calling a Pest Inspector may seem like a costly step to getting rid of these little things. However, if left without proper attention and/or untreated, these incredibly destructive pests could cost you more in property damage than you can imagine. We recommend that the moment you see signs of termites on your property you give a Certified Pest Inspector a call. Humboldt Termite & Pest can provide you with the professional knowledge and experience needed to determine if termites have setup shop and are chewing away at your home or business. Professional termite inspections can help you correctly identify the size and scale of the problem at hand and provide various treatment methods for your consideration. At Humboldt Termite & Pest Control we pride ourselves on going beyond the industry standard, while making sure to always adhere to laws, rules, and regulations. Our technicians are trained to provide treatment solutions specific for your termite infestation that are customized to your specific needs and unique requirements. No two termite infestations are alike. Our treatment solution follows these core steps to make sure your home and investment is protected. Step 1: Identification of Root Cause for Termite Infestation - Our first step is to pin point the problem areas and find the source of the problem. It's our goal to provide you options to tackle your termites with confidence that they will be removed for good. Step 2: Removal of Termites and Repair of Damage - It's our job to make sure the removal of termites is as stress free as possible. We'll remove those little bugs and make sure your home and business can return to normal. Step 3: Continual, Ongoing, Preventative Protection - Keep your investment safe knowing that our team is watching and working to keep your home and business safe from termites. If you're in a location that termites love, we strongly recommend regular inspections. Warranty: As a reminder, we offer a warranty on all of our services. If the pests come back, so do we at no charge. We are confident in the services we provide. Rest easy, we're on the job. Rest Easy, We're On The Job. Termites can cause a lot of expensive damage quickly to your homes. Call a pest inspector ASAP if you believe you have Termites. Ready to be Termite Free? 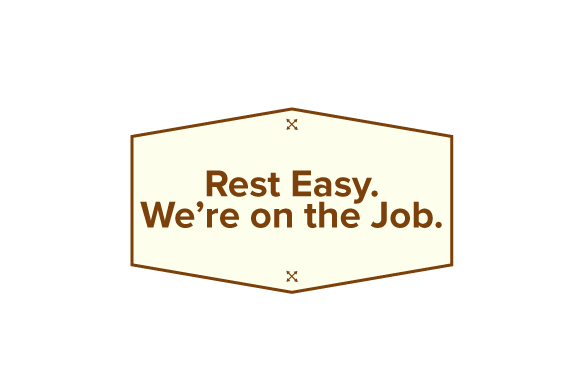 Our team of professionals is ready to help you rest easy. We can safely say we hate ticks. Ticks are a disgusting pests, but don't worry our trained technicians can help not only eradicate your infestation but make sure they never return.